Giving Cookie Dough as a gift is always a welcomed gift! 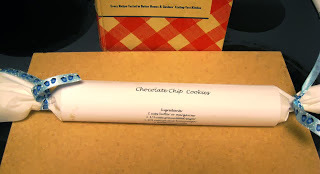 This Thrifty Gift Friday shares a cute way of wrapping the cookie dough for gift giving, that will not break the budget! I love to make my Master Mixes of cookie dough for the freezer each fall. These bulk recipes makes 4 logs of dough each, so in just a few minutes I can make 4 gifts to hand out! Type or hand write cookie dough recipe the long (landscape) direction on white or festive paper. Wrap the recipe around the parchment paper, and seal along its seam with a stick of glue if necessary. Jan's Tips: Make it easy! Cut & Paste the recipes above into a word document and then change the font to a handwriting or cursive font! Short on time? : It's o.k. to "cheat" and buy a log of store bought dough! Seriously, the Cookie Police aren't going to show up at your doorstep!